When Joe and I got married we didn’t have anyone to be our flower girl and I was disappointed. Who can resist a cute little girl dressed up like a fairy princess? Riley was recently asked to be a flower girl for friends of ours. We are so excited. 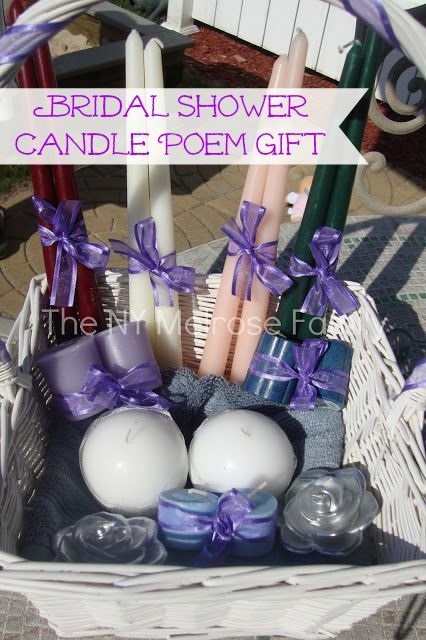 I wanted to find a perfect gift for the bride and I remembered the candle poem basket that I was given for my shower. 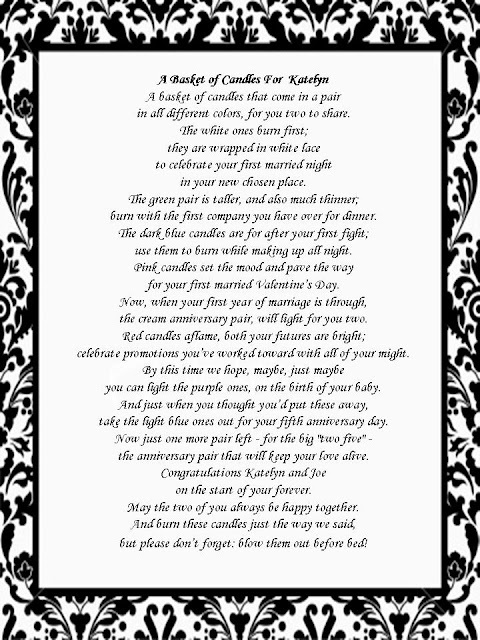 So, I put together the perfect Bridal Shower Gift that the bride will always remember because there is a special candle for each major moment in their life. The invitation came for the wedding this week and I love it! 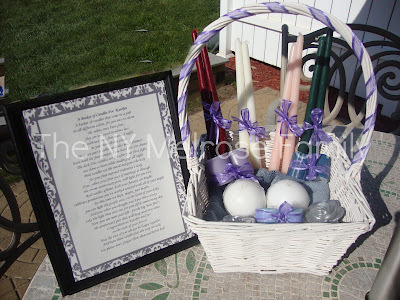 The invitation was black damask on a white background with a sheer purple ribbon as an accent. I created the poem surrounded by a similar damask. 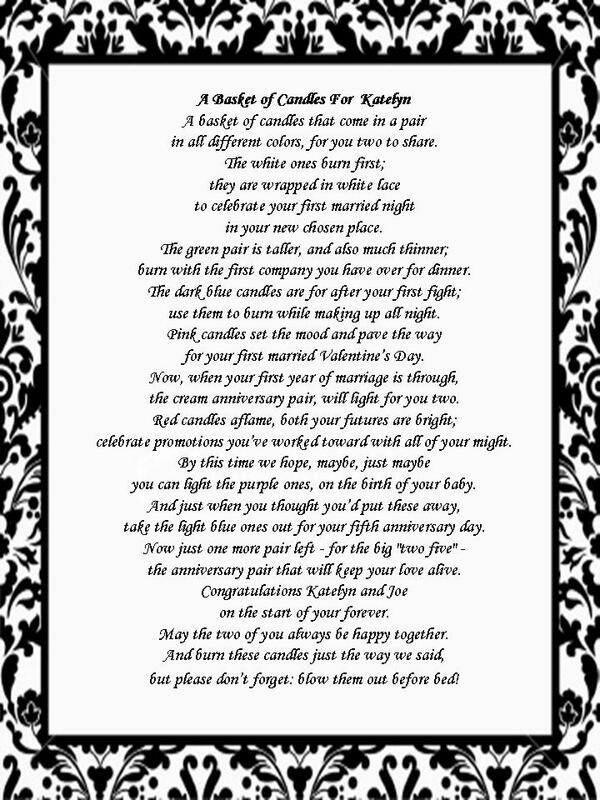 You can download your own bridal shower candle poem for free. I wanted to frame the poem and I had a cherry wood frame lying around that I hadn’t used for anything. 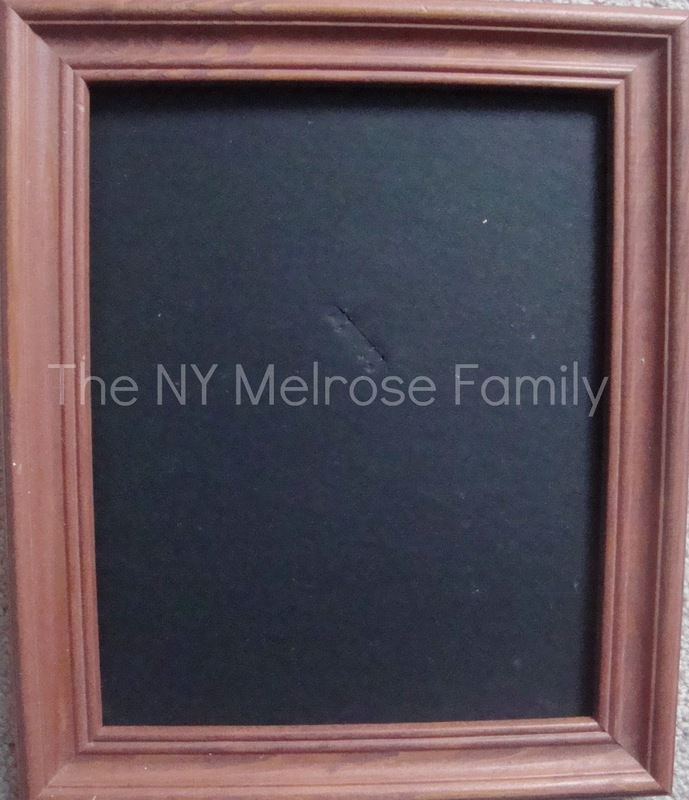 I spray painted the frame black and simply placed the poem inside. We also got the bride a wash cloth, hand towel and bath towel from her registry. I placed the wash cloth and hand towel on the bottom of the pretty white basket. I wrapped a purple ribbon around the handle of the basket. 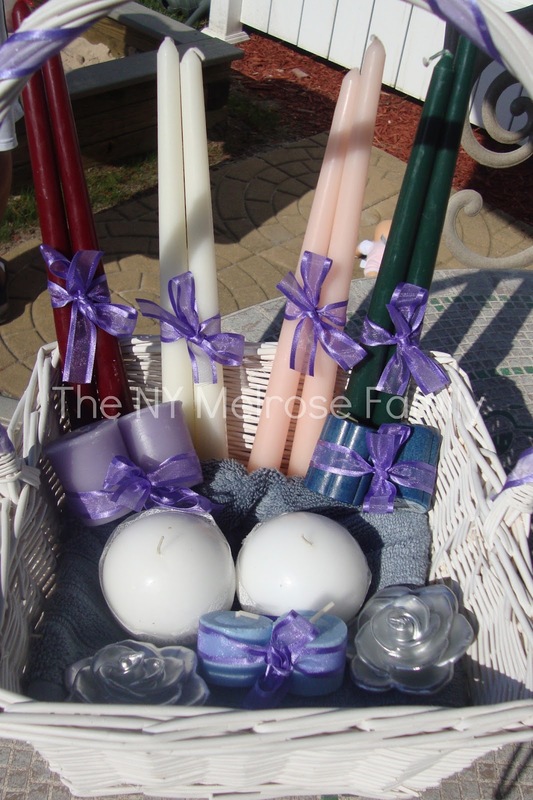 I also tied the pairs of candles with the same purple ribbon. The white candles I hot glued white lace ribbon around the center. I hope she loves it! We are so excited for their wedding! 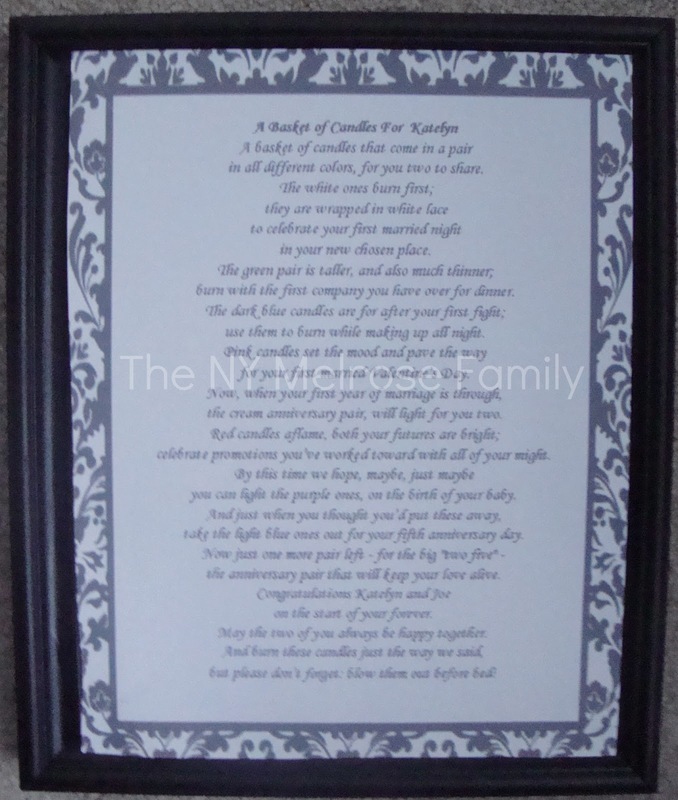 What a lovely gift…I am sure the bride will love all the beautiful items you have included! I think gifts made like your basket are far more precious and shows how much love is in your heart. Thank you for sharing and have a wonderful week! So pretty! I'm sure she will love it! What a neat gift. My girls are going to be flower girls next week too. They are so excited! Such a pretty gift. I think it's perfect. I am your latest follower via the blog hop. Hope you will stop by and say hi. 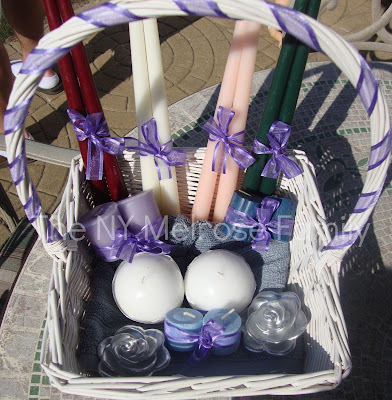 Candles are a great gift and this basket is so sweet. I love weddings. I'm your newest follower and thank you for visiting Inspirations by D.
What a lovely and thoughtful gift. The poem is so sweet and the basket a perfect accompaniment. Thanks for stopping by our blog! We are now following you!! What a great idea. Thanks for linking up with us this week! What a thoughtful and pretty gift. Thanks for sharing at Terrific Tuesdays. Such a charming way to remind the bride and groom that marriage is for life, not just the excitement of their wedding day. What a lovely gift! Thanks so much for sharing on Tout It Tuesday. an exert on this subject. Well with your permission let me to grab your feed to keep up to date with forthcoming post.